A 1999 paper co-authored by astrophysicist Dr. Joan Feynman [sister of the famous physicist Richard Feynman] is strongly supportive of the Svensmark cosmic ray theory of climate. 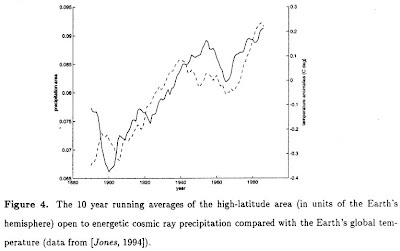 The paper shows a remarkable correlation of Earth's high-latitude area open to cosmic rays [which may seed cloud formation] and global temperature. According to the authors, "High energy cosmic rays may influence the formation of clouds and thus impact weather and climate. Due to systematic solar wind changes, the intensity of cosmic rays incident on the magnetopause has decreased markedly during this century. The pattern of cosmic ray precipitation through the magnetosphere to the upper troposphere has also changed. Early in the century, the part of the troposphere open to cosmic rays of all energies was typically confined to a relatively small high-latitude region. As the century progressed the size of this region increased by over 25% and there was a 6.5° equatorward shift in the yearly averaged latitudinal position of the subauroral region in which cloud cover has been shown to be cosmic ray flux dependent. We suggest these changes in cosmic ray intensity and latitude distribution may have influenced climate change during the last 100 years." High energy cosmic rays may influence the formation of clouds and thus impact weather and climate. Due to systematic solar wind changes, the intensity of cosmic rays incident on the magnetopause has decreased markedly during this century. The pattern of cosmic ray precipitation through the magnetosphere to the upper troposphere has also changed. Early in the century, the part of the troposphere open to cosmic rays of all energies was typically confined to a relatively small high-latitude region. As the century progressed the size of this region increased by over 25% and there was a 6.5° equatorward shift in the yearly averaged latitudinal position of the subauroral region in which cloud cover has been shown to be cosmic ray flux dependent. 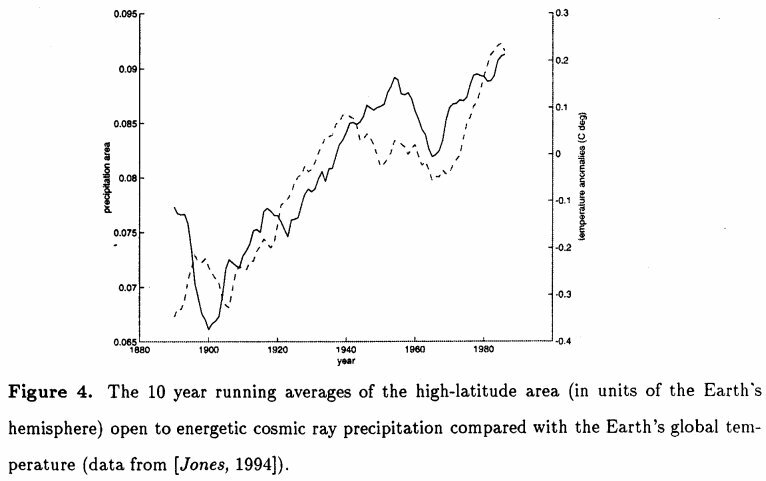 We suggest these changes in cosmic ray intensity and latitude distribution may have influenced climate change during the last 100 years.